Two local high school seniors with championship pedigrees earned district cross country titles Wednesday by winning state-qualifying 3.1-mile races by wide margins. Senior Chase England of Wood River and senior Laurel Fiddler of the Community School ran away with titles—England winning the Great Basin Conference boys’ title by 24 seconds in Sun Valley, and Fiddler capturing the 2A/1A district crown by 56 seconds at windy Gooding Golf Course. England’s mother, Maureen McGinnis, won a State Class B cross country title as a Wood River sophomore 30 years ago in 1982, and then led the Wolverine girls’ cross country team to State Class B championships as a junior and senior in both 1983 and 1984. Fiddler’s mother, native New Englander Nancy Fiddler, was a 14-time U.S. National champion in cross-country skiing from 1987-93 and a two-time Olympian in that winter sport. On Sun Valley’s White Clouds Golf Course Wednesday, England earned his third victory in eight starts this fall with a 17:46 finish on a challenging high-altitude course that featured 400 feet of elevation gain. He led 115 finishers. Another Wood River senior, Ketchum Wilt (18:27), had a strong fifth-place finish. Two others—15th-place junior Ty Reinemann and 16th-place sophomore Alexis Gonzalez—helped coach Monte Brothwell’s Wolverines into third place in a six-school field. The top 14 finishers in the Great Basin boys’ and girls’ races earned medals and automatic berths in the State 4A footrace Saturday, Oct. 27 at Hells Gate State Park along the Snake River in Lewiston. Also, the top three teams also earned state trips as full teams—seven runners and one alternate. Burley’s boys repeated as GBC boys’ champions 34-56 over Twin Falls, but Wood River (4th last year) slipped past Jerome 62-68 to grab the third-place spot and state trip. Jerome senior Jasmine Nesbitt (21:09) ran alone for much of the race and topped 70 GBC girls on the White Clouds course. The defending conference champion Tigers put five runners in the top 10 and nipped Twin Falls 22-40. Coach Heather Miller was very proud of the Wolverine girls after they put five runners in the top 20 and clinched the third-place state trip as a team by a 66-102 margin over Canyon Ridge. Last year the Hailey girls were fourth, missing state 76-85 behind Canyon Ridge. Sisters Janel Passey (23:40), a junior, and freshman Amanda Passey (23:58) were the leading Wood River girls in seventh place and 11th place, respectively. The only senior on the state-qualifying team, Brooke Lawrence (18th, 24:55), will be making her third trip to state along with England. In all, 26 Wolverine thinclads competed in the 185-runner field on an absolutely gorgeous and windless fall afternoon in the mountains. At Gooding Golf Course, Fiddler was the dominant girl but one other Cutthroat qualified for state. He was junior Nate Nasvik (18:36), who placed second in the boys’ 5-kilometer race 15 seconds behind Dietrich’s junior individual medalist Jacob Dalton (18:21). Wood River High last hosted the conference meet in 2005 on essentially the same course, although at that time the White Clouds Golf Course was the former Sun Valley Gun Club and the course was comprised of dirt trails instead of the current pavement and pavers. The only other time the district meet was held on the Sun Valley Golf Course was in 1981, when England’s mother was a Wood River freshman. This year’s course started and finished on the No. 9 fairway of the new White Clouds course. When she won the State Class B individual title in 1982, Maureen McGinnis was a sophomore and the girls’ course measured 3,000 meters instead of 5,000 meters. She won that 3k race on a wet Shadow Valley Golf Course track in Boise by four seconds. In 1983, the Wolverine “Green Wave” coached by Bob Shay and Dennis Dempsey won its first State Class B team title since 1975 by a 50-64 margin over the Weiser Wolverines. McGinnis placed third on the 5k state course at Shadow Valley, 14 seconds behind Nampa Christian senior Michelle Skyles, who went on to coach the powerful Jerome High School girls’ basketball program for many years. After winning its third straight district championship at Jerome Country Club in 1984, Wood River’s girls repeated as state champions at Freeman Park in Idaho Falls by a 45-57 margin over Weiser. McGinnis, then a senior, placed second as an individual. England’s mother is still a Wood River Valley resident and still stays fit by running. She helped coach the Wood River cross country team this fall and watched with enthusiasm as Chase win the district title Wednesday, as did Chase’s grandfather Brian McGinnis. This fall, England in eight races never clocked a finish that exceeded 18 minutes. He won the Twin Falls/Jerome Invitational Aug. 24 in Twin Falls by 48 seconds in 17:57, and then clocked the same 17:57 time in winning the Sun Valley Classic 3.1-miler at Sagewillow Farms Sept. 7. England was sixth at Rigby (17:32), 20th in the big Bob Firman field at Boise (17:01), second at Mountain Home (16:59), sixth at the Dani Bates Invitational in Twin Falls (16:39) and third at Canyon Ridge (17:40). 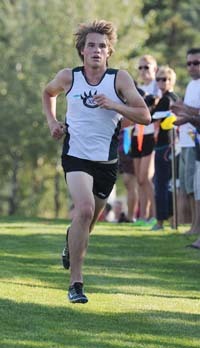 The last Wood River district champion was Chase Caulkins who was a senior in 2009 when he won the GBC race at CSI in Twin Falls. Caulkins went on to capture the 2009 State 4A footrace at Circling Raven Golf Course in the northern Idaho community of Worley. In his two previous Wood River seasons, England placed 10th in district and 31st at state in 2011, and ninth district and 13th at the state meet in 2010 when the Wolverine boys won the state team championship. GBC boys: 1—Chase England (WR) 17:46. 2—Matthew Schenk (Twin Falls) 18:10. 3—Jackson Knopp (Burley) 18:17. 4—Jeremy Stark (Twin Falls) 18:25. 5—Ketchum Wilt (WR) 18:27. 15—Ty Reinemann (WR) 19:16. 16—Alexis Gonzalez (WR) 19:25. 25—Cameron Bingham (WR) 19:59. 31—Jimmy Holcomb (WR) 20:28. 34—Patrick Schneider (WR) 20:38. 45—Connor Hayes (WR) 21:29. 46—Nelson Cantrell (WR) 21:34. 81—Nash Hartdegen (WR) 23:36. 83—Ostin Arters (WR) 23:40. 86—Xavier Haemmerle (WR) 23:49. 92—Colby Castle (WR) 24:18 (115 finishers). GBC boys’ team standings: 1—Burley 34. 2—Twin Falls 56. 3—Wood River 62. 4—Jerome 68. 5—Canyon Ridge of Twin Falls 165. 6—Minico of Rupert 167. GBC girls: 1—Jasmine Nesbitt (Jerome) 21:09. 2—Kayla Green (Jerome) 22:37. 3—Jordan Mogensen (Jerome) 23:09. 4—Hailey Gomez (Twin Falls) 23:20. 5—Ashlyn Aardema (Twin Falls) 23:27. 7—Janel Passey (WR) 23:40. 11—Amanda Passey (WR) 23:58. 13—Mariah Stout (WR) 24:11. 18—Brooke Lawrence (WR) 24:55. 19—Grace Gorham (WR) 24:59. 21—Avery Closser (WR) 25:02. 23—Hallie MacPherson (WR) 25:12. 28—Brooke Sundholm (WR) 25:43. 34—Sophia Deklotz (WR) 26:36. 39—Shelby Barnes (WR) 27:34. 42—Alexandria Begley (WR) 28:02. 49—Lex Shapiro (WR) 29:07. 62—Karady Beck (WR) 31:35 (70 finishers). GBC girls’ team standings: 1—Jerome 22. 2—Twin Falls 40. 3—Wood River 66. 4—Canyon Ridge 102. 5—Burley 155. 6—Minico 180.